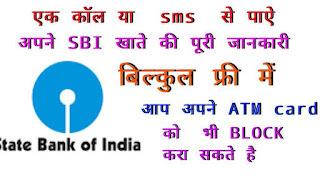 SBI Quick – MISSED CALL BANKING is a new service from the Bank which involves Banking by giving a Missed Call or sending an SMS with pre-defined keywords to pre-defined mobile numbers. Available for SB/CA/Overdraft/Cash-credit accounts. from the mobile number available in bank's records for that particular account. Confirmation message will be received indicating successful/unsuccessful registration. If successful then you can start using the services. 2. Ensure that your mobile number is updated with the Bank for that account number by visiting the Home Branch. You can get the last ‘clear' balance on the account. For More Important Daily use Toll Free Numbers to Make FREE Calls from anywhere in India to Customer Care and Helpline, Download our Small Mobile App "TOLL FREE NUMBERS" from Google Play Store.